"They won't bite. A biotech company called Intrexon hopes these genetically engineered #mosquitoes can help stop the spread of the Zika virus. The insects were developed mainly to fight dengue fever, but Zika is spread by the same type of insect. When the male mosquitoes are released to mate with wild females, the offspring die before reaching adulthood. Now Intrexon — which has ventures ranging from potential cancer cures to cloned kittens — needs to persuade federal agencies, foreign governments and nonprofit health organizations to place orders. It must also counter caution from the @worldhealthorganization and federal officials, who question whether the technique will be effective on a large scale. 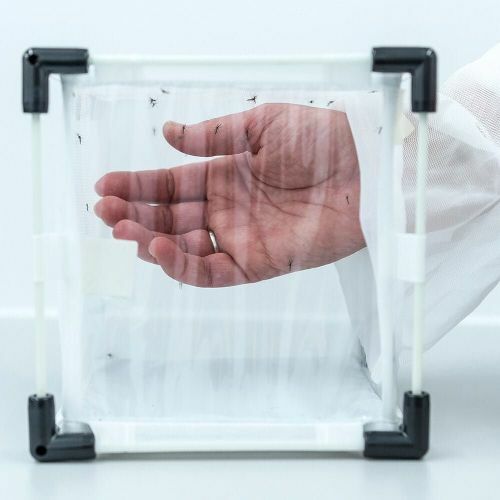 Andrew Testa photographed a worker with her hand in a cage full of genetically modified male mosquitoes." By nytimes on Instagram.